A preforeclosure sale, commonly referred to as a short sale, is the sale of a residential property in lieu of foreclosure for an amount less than what is owed on the mortgage. It’s one of those scenarios that should be stringently avoided, but nonetheless became more common after the economic downturn of the late 2000s. So, it’s important to understand if and how someone can again buy a home with a mortgage after having experienced a short sale. First, let’s back up and look at what happens in a short sale scenario. During and just after the downturn we most often saw this happen when a homeowner/borrower got in financial distress, needed to sell their home, but could not get a sale price on the home to cover what was owed on it. In such a circumstance, the homeowner/borrower would ask the servicer of the mortgage, in essence, “can we sell the home for this much and, in so doing, only pay X amount, rather than the full amount owed on the mortgage?” Obviously, banks and other lenders do not take such lightly, but often saw scenarios in which recovering part of what was owed on a mortgage was preferable to seeing it default in full. But, again, it’s important to note that a short sale must be pre-approved by the servicer of the mortgage. A preforeclosure sale is indeed a derogatory credit event and thus impacts an individual’s ability to obtain a mortgage on a new property in two ways. First, the preforeclosure sale will significantly lower the individual’s mortgage credit score, potentially too low to qualify for a mortgage. Conventional mortgage underwritten to Fannie Mae or Freddie Mac guidelines: 4 years. FHA mortgage. If no payments on the previous mortgage were 30 days late for the 12 months prior to the sale of the property and all other debt payments were made on time during that 12-month period – no waiting period. Otherwise, the waiting period is 3 years. It’s worth noting that an individual cannot obtain an FHA mortgage if the preforeclosure sale was pursued because the property’s value had fallen and a similar or superior property was purchased at a reduced price (compared to current market) within a reasonable commuting distance to the short-sold property. VA mortgage – 2 years. USDA mortgage – 3 years. Extenuating circumstances may shorten the waiting period if they can be properly documented. Such circumstances are defined as those beyond the borrower’s control that result in a substantial and sustained decrease of income or increase of liabilities. These may include the death, serious illness or long-term disability of a primary wage earner; loss of job through no fault of the employee; large uninsured medical expenses for a spouse or child; etc. Divorce or the inability to sell the property due to a job transfer or relocation are not considered extenuating circumstances. Conventional mortgage – 2 years. FHA mortgage – no waiting period if the borrower has re-established good credit since the sale. VA mortgage – 1 year if the borrower has re-established good credit since the sale. USDA mortgage – no waiting period if the borrower has re-established good credit since the sale. The waiting period will increase to seven years if the individual has an additional derogatory event (bankruptcy, foreclosure, charge-off of a mortgage account, deed-in-lieu of foreclose, or a second preforeclosure sale) during the past seven years. Jumbo loans are usually underwritten to Fannie Mae or Freddie Mac guidelines. However, since jumbos are not sold to those two entities, the borrower with a preforeclosure sale may need to wait seven years before obtaining a jumbo loan. Even if the borrower cannot qualify for one of the loans described above, they may still be able to obtain a mortgage. Some lenders offer “fresh start” programs under which there is no waiting period required after a single derogatory event, such as a short sale. With the exception of the preforeclosure sale, the borrower’s credit history will need to be acceptable. Typically, the borrower will need to make a down payment of at least 20% and can expect to pay a substantially higher interest rate than the current market rate for a similarly situated borrower without a derogatory event on his/her credit report. A higher interest rate is the result of the lender taking a greater risk on a borrower who has had past repayment issues. The date assigned to the preforeclosure sale is the date that the sale/purchase closes, rather than the date that the current servicer agrees to the transaction. In escrow states (AZ, CA, NV, UT and WA), the date assigned to the preforeclosure sale is the recording date. And, although as noted above divorce is not generally considered among extenuating circumstances, an exception may be granted for a divorced individual if the mortgage involved in the preforeclosure sale was current at the time the divorce was granted; the ex-spouse received the property in the settlement agreement; and the ex-spouse subsequently sold the property through a preforeclosure sale. A second derogatory event in the last seven years may be acceptable under some programs. A short sale involving more than one mortgage provider – for instance, where there is both a first and a second mortgage involved – is likely more difficult to navigate both during and after the short sale. To recap, a short sale is indeed a circumstance to be avoided, but given the economic challenges of the last few years, we have seen more of them. The best advice for navigating a potential home purchase after a short sale is to confer with a trusted mortgage professional who knows your individual circumstances, so you can re-enter the world of mortgages if and when the time is right for you. Credit is one of the most important, and one of the least understood, facets of our global economy. Consumer credit allows for greater consumer spending, in the form of home purchases, auto purchases, personal loans, and credit cards. Leverage, however, multiplies both the upside and downside of the risk-reward parity. Too much leverage can be credited for the increase in the percentage of Americans with “poor” FICO scores below 600, from 15% to over 25% in the past couple years, now representing a group 43 million strong and counting according to the Fair Isaac Company. Compound this with stricter mortgage underwriting and you have less demand. Excess foreclosures and short sales add to the supply side of the equation, whereas more supply and less demand in economics inevitably leads to price reductions. And now to Mr. Homebuyer. Mr. Homebuyer realizes that rates and prices are at extreme lows and likely will not stay there much longer. If Mr. Homebuyer has bad credit, how does Mr. Homebuyer effectively take advantage of such a rare opportunity? What EXACTLY is a “FICO” score and why is it important? 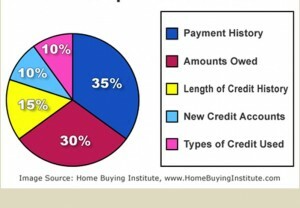 To understand this concept, one must first understand credit reporting. As we begin using credit, we also begin establishing relationships with the creditors that extend this credit to us. These relationships are documented by the creditor, and are reported by your creditor in most cases to a credit bureau. The rationale is that by documenting your history, current and potential creditors will best be able to manage you as a borrower. As credit bureaus collect and store your information into files called credit reports, they sell this information to creditors, for credit evaluation, and third parties. The major credit bureaus are Experian, TransUnion, and Equifax, along with notable mentions Innovis and PRBC. The Fair Isaac Company developed a formula, which they co-branded/licensed in slight variation with each credit bureau, that is intended to predict your probability of defaulting in the future using a scale from 350 to 850, the higher the number the lower the probability of default. This formula is an algorithm which, once understood, proves extremely useful in playing and winning the game of credit scoring and getting that mortgage or auto loan. Your FICO score is not dependent entirely on what you do because you are guilty by association. The Fair Isaac Company separates all the credit reports into groups, comparable to indexing, based on two factors: your oldest open account and your average account age. This means that the older your oldest open account is, the better your group/index will be rated, and the better your FICO scores will be. The same concept applies with the average account age except on a lesser scale. This is why closing out a very old credit card you may not be using will lower your FICO scores. In my personal experience, I have seen individuals add as many as 100 points to their FICO score simply by adding themselves as authorized users to old yet active credit card accounts that a relative or spouse has. Keep in mind that opening up a new account will lower your average account age and paying off an account entirely, excluding credit cards, is treated by FICO scoring as equivalent to closing the account; in other words, finally paying off a 30 year mortgage, especially if it is your oldest account, will surprise you with a lower FICO score. I checked my credit at Experian/TransUnion/Equifax and my credit score is X. My banker said it was Y. Why doesn’t my banker have an accurate credit score? If you are using a credit monitoring service that offers you your “credit scores”, read the fine print. 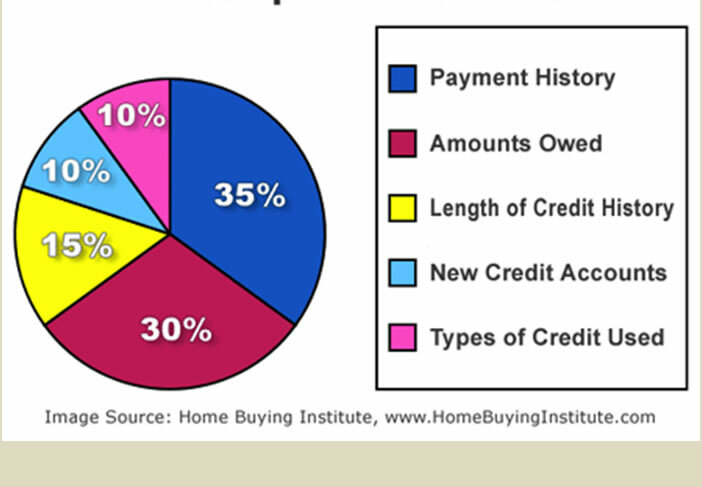 If it’s not a “FICO” score, which is used by 90-95% of major lenders, than you are paying for a modeled credit score. Each credit bureau has taken advantage of laws like the FCRA, or the Fair Credit Reporting Act, to confuse you into buying their worthless versions of “credit scores”. Experian, for example, has the most popular credit monitoring program, ads for which you may have seen or heard with the catchy “freecreditreport.com” slogan, and they call their version of a credit score a “PLUS” score. I should pay off or settle my bad debts? Paying off a debt and removing it off your credit reports are two different functions. The more important of the two is always removing it off your credit reports since creditors look at your credit reports. So how do you remove it? Medical collections, for example, fall under the jurisdiction HIPAA, the Health Insurance Portability and Accountability Act, which often allows you to remove these off your credit reports through formally disputing the item and without payment of the item itself. The same tactic could also be employed for any collection account, as they are all regulated by the FDCPA, or the Fair Debt Collections Practices Act. In a last resort scenario where all else fails, settling or paying off the account should only be pursued once a pay-for-delete agreement has been reached or it will continue to remain and hurt one’s credit, albeit with a “closed”, “settled”, or “paid-in-full” status. If the item is especially old, such a payment made without deletion often results in lower FICO scores because newly reported information effects one’s credit with much greater weight. I should pay off credit card accounts with a higher interest rate (APR) and pay more than the minimum payment each month? FICO scoring looks at your credit card utilization in a very different way than you and I. The optimal percentage use overall, which is calculated by taking your credit card “balances reported” divided by your credit limits reported, is 7%. Using less than, or more than, 7% overall will lower your FICO scores, although less than 7% would be advisedly better. Keep in mind that your “balances reported” and your current balances are different: “balances reported” has to do with when your creditor reports your balance to the credit bureaus. Knowing when this is, as simple as calling your creditor and asking, will allow you to manage your credit utilization rate better, especially for someone whose credit card usage is on and off throughout the month. Charge cards, which American Express is notorious for, may not report a credit limit and, therefore, can have a greater negative impact when holding a balance as it will have to be offset by other credit card limits. The number of credit cards you have which have balances, and the utilization on each, also affects the FICO scores, although to a much lesser degree than overall utilization. Paying more than the minimum payment each month, while fiscally prudent, is irrelevant as it is not used in your FICO score calculation. A HELOC, or Home Equity Line of Credit, will be treated as a revolving account the same as a credit card, although certain bureaus, like TransUnion, allow these to be treated as installment loans under certain circumstances (i.e. >$30k HELOC). I should not make any inquiries into my credit? First, let’s discuss the difference between soft inquiries and hard inquiries. Soft inquiries are those that are made by you, the consumer, into your own credit report, or they can be inquiries made by creditors for marketing purposes, a preapproved credit card offer being case in point, and lastly those made for other non-financing purposes (background, employment, tenant screening, etc.). I always recommend to my clients that they “opt-out” of soft inquiries made for marketing purposes by going to www.optoutprescreen.com or calling 1-888-5-OPT-OUT, each of which are mandated by the FCRA for consumers who do not want their credit file information sold to third parties. Hard inquiries, on the other hand, are inquiries that are made for the purpose of obtaining credit. Although they stay on your file for two years, the only inquiries that effect you are those that were made within the last 12 months. The more recent the inquiry, the more it will be weighted towards your score. The more inquiries you make within the last 12 months, the less each additional inquiry will hurt. I do not, however, suggest going wild with inquiries. Whenever you are looking to obtain credit, employ a technique called “Rate Shopping” – so long as the hard inquiries you initiate are coded the same (i.e. mortgage loan for home purchase inquiry), each one that you make within the last 45 days will only count as one inquiry. This does not work for revolving accounts, such as credit cards. Credit repair doesn’t work? Credit repair can and does work for most people. There are a select few who will have difficulty getting their credit repaired due to the nature of their situation. Although we’ve had some success, federal tax liens, child support obligations, and student loan delinquencies are among the most difficult of items to resolve. Setting the right expectations is crucial to ensuring customer satisfaction. It is rather unfortunate that credit repair companies that do not perform quality work exist as the industry as a whole receives a stigma. Doing a quick Google search of the company, checking the Better Business Bureau, or talking to friends and family who have successfully ventured into and out of a credit repair program, are great first steps to ensuring you are not being scammed. Ryan McElveen is the owner, founder, and Chief Executive Officer of CredNet Corporation, a credit repair and real estate services company in Los Angeles. A real estate broker with a Master’s Degree in Business Administration from Pepperdine University, Ryan has found a passion in helping a large underserved market understand credit and the strategic paths to homeownership. Since its inception in 2007, CredNet has become well-known by motorists and regional finance professionals with its catchphrase: “It’s Not Just Credit Repair. It’s 1-800-CredNet.” If you would like to learn more, please visit: www.crednetusa.com. Whether you need to short sell your home (to avoid foreclosure and save at least “Some” of your credit) or are in the market to buy and are curious about buying a short sale property, there are some things you should know going into it. 2.If you have 2 loans on your property, it is likely that whoever buys your home will have to come up with extra money to pay off the 2nd. A good short sale listing agent will be savvy to navigate this potential pitfall. 3.Through 2012, the debt that is forgiven by your lenders in a short sale of your primary residence will not be considered taxable income by the State or Federal government. This is a good thing. After they lift this moratorium, the debt forgiven in a short sale (or foreclosure) will again become taxable income. 4. Most real estate loans used to originate the purchase of a home in California are non-recourse loans, which means that the lender cannot go after you for a deficiency judgment after the sale has completed. 5.Last but not least, you are expected to demonstrate hardship to your lender(s) as part of your application for acceptance of the short sale. If you are financially sound and are up to date on your loan payments, it’s unlikely that your lender(s) will accept the short sale. 1.You will generally get the best deal when you purchase a short sale because the seller is the most motivated of all sellers and cares the least about what price they get. 2.The seller first needs to accept your offer and their acceptance of your offer is then subject to short sale lender approval. If the short sale lender has already accepted a previously submitted purchase contract and you are coming in as a subsequent buyer, the process should go quicker, especially if the price you have agreed to is as least as high as in the previously accepted purchase contract. 3. 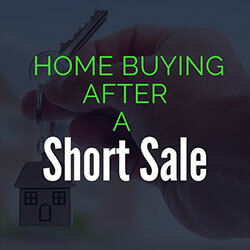 While it is always best to “expect” 2-3 months for the short sale approval, it is sometimes completed (by the short sale lender) within a month. It depends on the lender, how many loans there are (it always takes a little longer with a 2nd loan), how quickly the listing agent puts together the short sale package (including your seller-accepted offer), and how often the listing agent follows up on the short sale approval. 4.Your contract time period terms (days to close, earnest money deposit, contingencies, etc) generally don’t start when the seller accepts offer. Instead, the days start ticking on the purchase contract once the short sale lender approves the purchase contract. One exception is that sometimes the listing agent will ask that you deposit your earnest money right away (so that you have some “skin in the game” up front, lessening the chance of you backing out), although that deposit is still fully refundable throughout the entire process of short sale approval and through your subsequent purchase contract contingency period. Overall, the Short Sale is a win-win for the buyer and seller as the seller gets a large mortgage off their hands and the buyer generally gets the property at a price that they know is a good/low one for today’s market. Knowing these key things going into it will give you the right expectations for a successful short sale transaction from either side.